An earsplitting screech harshly lowers the target’s Defense stat. The user fires a beam of light at its target. The move’s type changes depending on the Drive the user holds. When the user knocks out a target with this move, the user’s Attack stat rises sharply. The user takes sure aim at the target. This ensures the next attack does not miss the target. The user launches steel bombs that stick to the target. This attack never misses. A horrible sound like scraping metal harshly lowers the target’s Sp. Def stat. The user strikes with a simultaneous three-beam attack. May also burn, freeze, or leave the target with paralysis. The user vibrates its wings to generate a damaging sound wave. This may also lower the target’s Sp. Def stat. The user’s mysterious psychic wave changes the target’s Ability to Simple. The target is infested and attacked for four to five turns. The target can’t flee during this time. The user soars and then strikes its target on the next turn. This can also be used to fly to any familiar town. 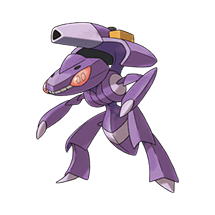 What do think about Genesect?